Sorry about the sporadic updates lately. Last week I took a few days off work as I was going to a bunch of Rocket From The Crypt shows. Then I ended up getting sick for a few days this week and when I'm sick, trying to write coherently is even harder for me than it typically is, so that's why this site has languished a bit. Don't worry, I haven't given up on it yet. 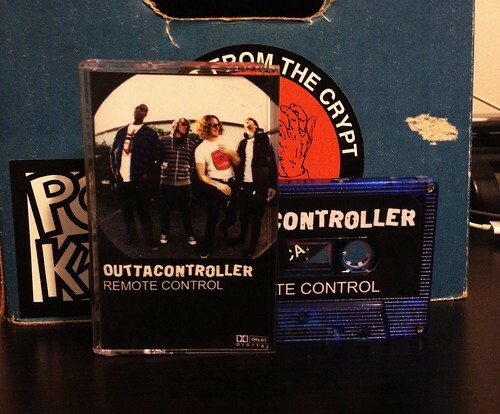 I'm still not feeling completely better, but I am feeling well enough to write a few words about this excellent Outtacontroller cassette. I'm even going to skip my usual cassette complaint as this was specifically made for a tour the band was doing and for some reason bands making cassettes so they have something to sell on tour doesn't bug me at all. I sure hope these songs end up on vinyl at some point, but for now the tape will do. On this cassette are 4 new songs, 2 cover songs (1 of a Ladytron song and the 2nd of a "When You Found Out" by The Nerves) and 2 songs recorded live on the radio at CKDU. Musically I've always felt that Outtacontroller straddles the line in between Hex Dispensers and Steve Adamyk Band, and if there are 2 bands to be compared to, those 2 aren't too shabby. We've got loud fast guitar, with catchy vocals & choruses. Though they've never ventured to my neck of the woods, I get the impression from their songs that Outtacontroller is likely a hell of a live band. I've read that Outtacontroller will have a new 7" coming out soon on Ptrash records and I believe they are also at work on their 2nd LP. Rest assured, I will be buying both of those records the moment they are available.